Since The gate lodges of Ulster: a gazetteer was published in 1994, its author, J.A.K. (Dixie) Dean, has been striving towards a complete inventory of this building type in Ireland. His aim was to identify and record existing and lost lodges for posterity in a further three volumes. Losses have been huge: it has been calculated that, of the 10,000 or more built over a 200-year period since the mid-eighteenth century, half have been demolished, and many of those surviving are derelict or ruinous. The additional seventeen years of research into the other three provinces of Connacht, Leinster and Munster have revealed the gate lodge’s extraordinary significance as a building type, particularly in Ireland but also in a British, European and world context. Lodges are present here in such quality and in such great quantity as to represent a massive as-yet-unrecognised contribution to our architectural heritage. Despite displaying detailed architectural sophistication to rival the ‘big house’ to which it is a prelude, the gatekeeper’s lodge has received scant coverage in print compared to the annual appearance of tomes in praise of houses of the aristocracy and gentry in Ireland. Hence this work is also an attempt to right that imbalance and to celebrate a domestic building of modest proportions. The field surveys and research being complete, Wordwell is now pleased to publish the second volume in this new series, Munster, which follows the style of the Ulster and Leinster volumes. There are descriptions of 2,775 gate lodges in the six counties and they are accompanied by 772 illustrations . A volume on Connacht will follow in 2018/19. Entries are numbered and listed county by county for ease of reference. Each entry heading gives the NAME of the property with its LOCATION. This heading (or subheading, where there is more than one lodge) is followed by the DATE of the building’s construction, its ARCHITECT and, should there be little or nothing evident on site, its CONDITION. Proposals that remain unexecuted are also indicated. An ILLUSTRATION generally precedes the DESCRIPTION, and REFERENCES complete the entry. 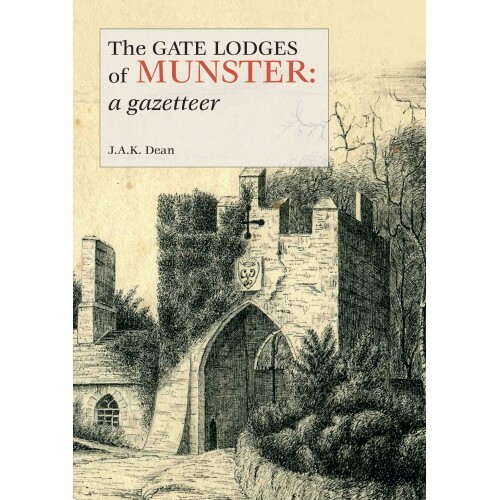 The gazetteer is preceded by an extensive essay on the history of the gate lodge in Munster, and the book is fully indexed. The book will have a link to an associated website on which larger format images of the illustrated gate lodges will figure. ORDER NOW to be sure of your copy.